Many people love Hydrangeas. They are a favorite. Even if you don’t have a lot of space to grow hydrangeas, you can grow them in a pot. There are many types you can choose from. 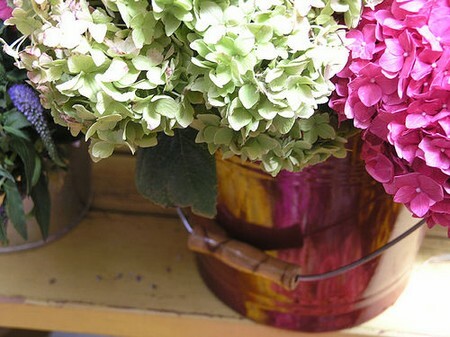 Potted Hydrangeas are a good way to spruce us a tight spot with some live, natural beauty. Hydrangeas can do well in colder climates as long as they are cared for properly. Potted Hydrangeas make require some attention but they are just as pretty as Hydrangeas grown in the ground. Here’s how to grow Hydrangeas in a container or pot. Go to a greenhouse of nursery to buy a Hydrangea bush. Choose a type that will do well in a pot. Ask the staff to recommend a Hydrangea bush to you that would bloom well in a container and in your climate. You need a good container to plant your Hydrangea bush in. The container must have a hole to drain from. Make sure the pot is 2-4 inches wider than the container you Hydrangea bush came in. Choose a good potting soil. Pour about 3 inches of soil into the pot. Mix granular fertilizer for Hydrangeas into the potting soil. Follow the directions on the label. Re-pot the Hydrangea bush into the container. The Hydrangea needs to be planted with the same level of soil it came packed with. Make sure the depth is the same. Add more soil if needed. Fill the container slowly. Stop filling the pot when the soil is approximately 3 inches from the top. Add 2 inches of bark mulch over the potting soil mixture. Bark mulch will keep the moisture in the bush as well as add a decorative flare. Make sure to water the Hydrangea bush immediately. The potting mixture should be moist all the time. Potted flowers and shrubs may fry quicker when potted. The moisture in the soil should be checked daily. Don’t expose the Hydrangea bush to strong winds or extreme sunlight. Morning sunlight is best. Sunlight in the hottest part of the day should not be used. 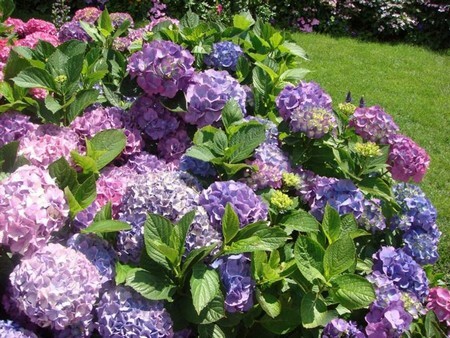 Nourish the Hydrangea with liquid fertilizer. For plants in the blooming stage every 3-4 weeks is enough. Stop fertilizing in early Fall. When the weather turns cold, relocate your Hydrangea bush to an unheated garage. Potted Hydrangeas should still be keep moist during this time. Move the Hydrangea bush back inside in Spring.